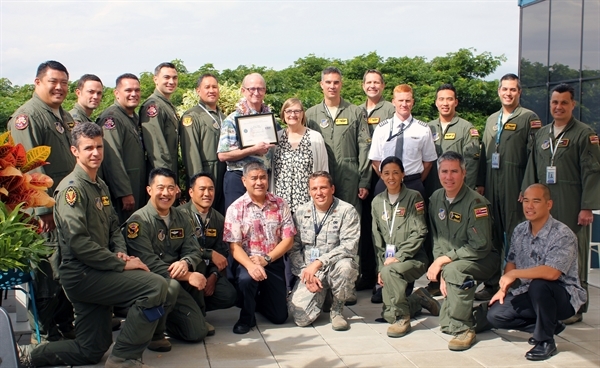 System Chief Pilot for Hawaiian Airlines Peter Clark, was presented with a Patriot Award Dec. 19 in recognition of his continued support provided to Kristof Sills, a Hawaii Air National Guard airman. The award was presented by Ann Greenlee, ESGR vice-chair and Employer Outreach Director. “ESGR is a Department of Defense office in Washington whose primary mission is to encourage cohesive relationships with civilian employers and our Guardsmen & Reservists. In addition, we provide USERRA briefings to our service members to ensure they know their rights and responsibilities under the law that protects their jobs when they return from a service period. When we are out talking to them, we also talk about the opportunity to recognize their employers for superior support of their membership in the Guard & Reserve because they can’t do what they need to do without a solid foundation – at home and at work. Supervisors like Clark respects and supports the employee for his military duty. His understanding in allowing for flexibility in scheduling work and time off, demonstrates great care for their employee”, stated Greenlee.